Be the first to share your favorite memory, photo or story of Dr. George . This memorial page is dedicated for family, friends and future generations to celebrate the life of their loved one. DR. GEORGE T. CALEEL, 87, DIED IN HIS HOME ON FEBRUARY 18, 2017 WITH HIS FAMILYAT HIS SIDE. HE ESTABLISHED A REMARKABLE REPUTATION IN HIS 60 YEAR CAREER AT CCOM WHERE HE TREATED PATIENTS AND WAS A PROFESSOR. 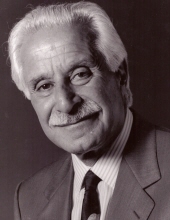 HE WAS BORN ON MARCH 29, 1929, IN DETROIT, MICHIGAN, TO PARENTS TAMER SARKIS AND MARY CALEEL AND CAME TO CHICAGO IN 1951. GEORGE T. CALEEL, D. O. MACOI, WAS A TRUE RENASSANCE MAN OF HIS DAY, ACTIVE IN MANY ARENAS FROM FINANCE TO REAL ESTATE TO MEDICINE BUT THROUGHOUT HIS EXTENSIVE CAREER HIS TRUE DEVOTION WAS ALWAYS TO OSTEOPATHIC MEDICNE. HE WAS VICE PRESIDENT FOR CLINICAL EDUCATION AND A PROFESSOR OF MEDICINE AND PHARMACOLOGY, AMONG MANY OTHER POSITIONS, AT MIDWESTERN UNIVERSITY (CCOM) OVER PAST SEVERAL DECADES AND WAS HONORED MANY TIMES BY THE AMERICAN OSTEOPATHIC ASSOCIATION, ULTIMATLEY BEING HONORED WITH: “THE GREAT PIONEERS IN OSTEOPATHIC MEDICINE AWARD” IN 2008. DR. CALEEL’S PAST POSITIONS INCLUDE VICE PRESIDENT OF MEDICAL AFFAIRS FOR HYDE PARK AND LOUISE BURG HOSPITALS; CLINICAL DEAN, CHICAGO COLLEGE OF OSTEOPATHIC MEDICINE; AND CHAIRMAN OF THE ILLINOIS MEDICAL DISCIPLINARY BOARD. HE WAS A MEMBER OF THE AOA, IOMS AND AMA. HE WAS CHAIRMAN OF THE AOA BUREAU OF OSTEOPATHIC EDUCATION. DR. CALEEL SERVED FOR MANY YEARS ON THE AMERICAN OSTEOPATIC BOARD OF NUCLEAR MEDICINE AND THE AMERICAN OSTEOPATHIC BOARD OF INTERNAL MEDICINE AS AN OFFICER AND EXAMINER. NOTABLY CALEEL WAS ALSO A CONSULTANT IN WASHINGTON DC DURING THE 60’S & 70’S FOR THE US DEPARTMENT OF HEALTH, EDUCATION AND WELFARE, THE DIVISION OF PHYSICIAN MANPOWER, NATIONAL INSTITUTES OF HEALTH. ADDITIONALLY, HE WAS A BOARD MEMBER OF LITTLE COMPANY OF MARY HOSPITAL AND THE ST. JAMES HOSPITAL FOUNDATION. HE WAS PRESIDENT OF THE OAK BROOK LIBRARY FOUNDATION AND SERVED AS A TRUSTEE OF THE VILLAGE OF OAK BROOK. DR.CALEEL IS SURVIVED BY HIS WIFE, REBECCA; SONS DR. GEORGE SARKIS (EMILEE) AND DR. TAMER GEORGE (ALTA); FOUR GRANDCHILDERN, ISABELLA, ELISE, CHASE, AND GEORGE JACOB; AND A BROTHER DR. RICHARD T. (ANNETTE). IN LIEU OF FLOWERS, DONATIONS CAN BE MADE IN HIS NAME TO THE INFANT WELFARE SOCIETY OF OAK BROOK, ILLINOIS AND ST. JUDE’S CHILDREN’S RESEARCH HOSPITAL. To send flowers or a remembrance gift to the family of Dr. George T. Caleel, please visit our Tribute Store. "Email Address" would like to share the life celebration of Dr. George T. Caleel. Click on the "link" to go to share a favorite memory or leave a condolence message for the family.